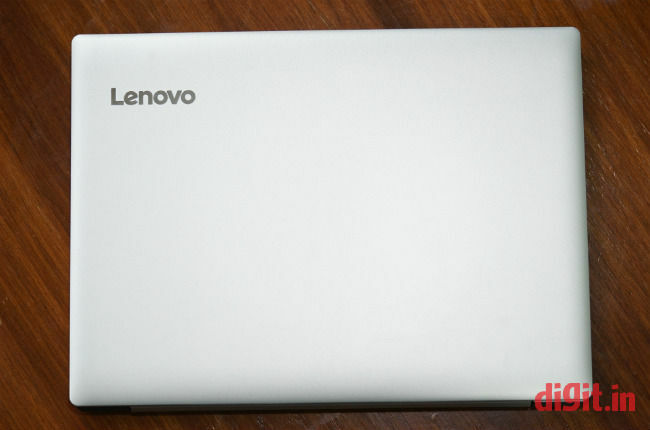 My feelings towards the Lenovo IdeaPad 330 are akin to those of a person who test-drove the feature-filled top-end variant of a Japanese hatchback but is now examining the exteriors of the base variant they ended up buying. Where they remembered seeing fancy chrome inserts they now see uninspiring black rubber beadings. Where they remembered seeing a neat white LED light they now see a black plastic cap. 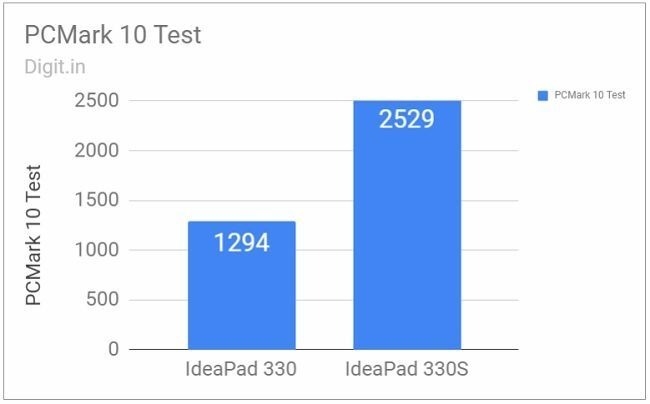 I should explain myself better: I was using the more sophisticated IdeaPad 530S and IdeaPad 330S before the IdeaPad 330 landed on my lap. Its increased thickness and weight over the other two became instantly apparent to me. That’s not all. On the inside, it wore an AMD sticker where there was an eighth-generation Intel Core series sticker on the other two. The right side had a blank plastic cap for a DVD drive. A touch apprehensive, I fired the IdeaPad 330 up to get to grips with the rest of the laptop. 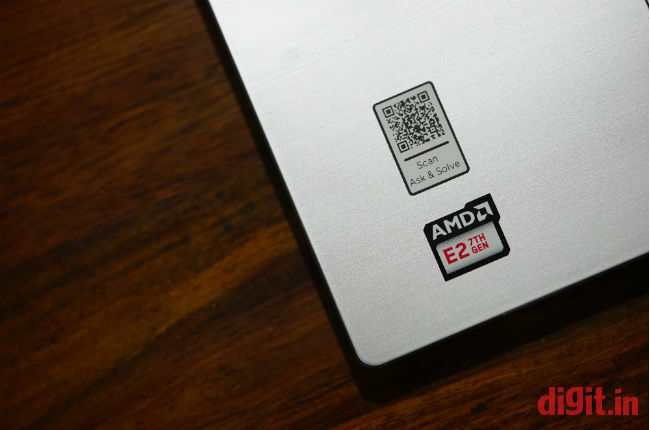 The model I received for review was powered by a seventh-generation AMD E2 processor, an integrated AMD GPU, had 4GB of RAM, and 1TB of hard drive-based storage. The display was a 14-inch LCD panel with HD resolution. In my review of the IdeaPad 330S, I’d written that the laptop closely resembled the more sophisticated IdeaPad 530S. I believed it shared the same premium and classy design even if it was a more watered-down model with more plastic parts than the IdeaPad 530S. The same is true of the IdeaPad 330S and the newly joined IdeaPad 330 too, except the latter is a lot more watered-down than the IdeaPad 330S. The body is made wholly of plastic, but the matte-like finish on the lid does its best to look metallic. The surface of the lid and the base flexes considerably under the pressure of fingers when it’s held firmly to be lifted. At 2.1 kilogrammes, the laptop feels heavy to lift, carry around and place, but it’s not a big bother once you get used to it. Tapping hard on the keys also reveals some unnecessary flex in the keyboard. The surface around the keyboard is of the same colour as the lid but has a brushed texture that gives its plastic nature away easily. The touchpad more or less matches the colour of the surface around it. A thick plastic hinge runs across almost the entire width of the display. There’s a thick black bezel around the sides of the display. The display hinge folds all the way back to 180 degrees. This is a useful feature when working with crossed legs on a bed or sofa. 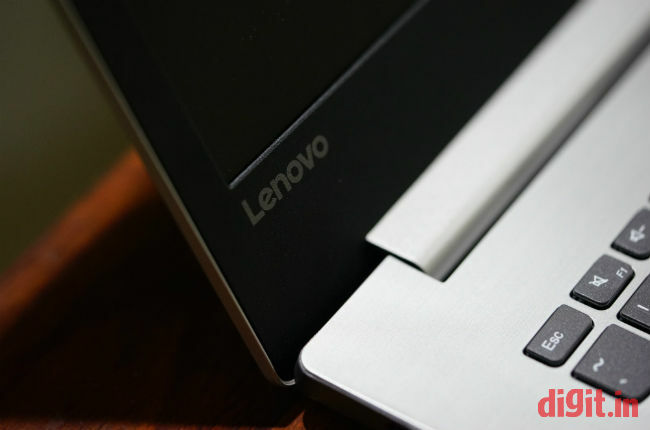 Lenovo branding, on the whole, is louder on this model and not as subtle as it was on the other two models. In summary, build and design on the IdeaPad 330 is passable. The minor creaks and flexes on the plastic body are a constant reminder of what’s lacking, but don’t get in the way of computing. I only wish the laptop were slimmer for a fourteen-incher. 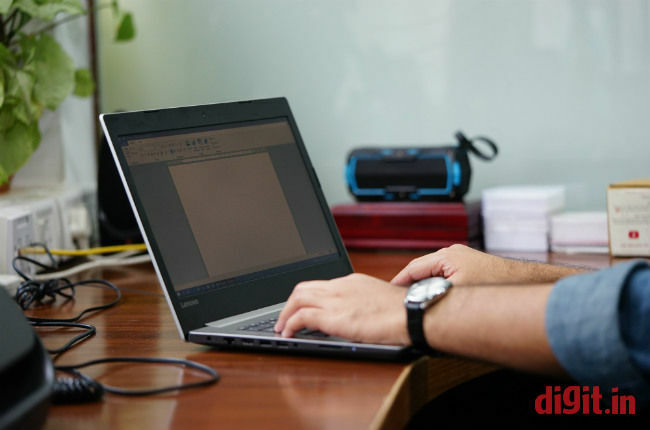 The Lenovo IdeaPad 330 comes with two display options: a 14-inch non-IPS LCD panel with a resolution of 1366 x 768 and a 14-inch IPS LCD panel with a resolution of 1920 x 1080. The model I received only got the former, but its performance is quite decent. At 71 LUX, the maximum brightness of the screen is sufficient for home and office, but not so much for outdoor areas like parks. Managing to reproduce only 63 percent of the colours on the sRGB scale, all colours look generally washed out. Text, in general, appears grainy on the IdeaPad 330’s display, whether it’s black text against a light background or vice versa. Pushing the display back even to 95 degrees distorts colours greatly to a point where they look unrecognisable. Text, luckily, stays mostly readable until the display is pushed farther back up to 130 degrees. Audio through the inbuilt down-firing speakers is clear but feeble. The speakers are good for plain vocals inside a quiet conference room of 15 x 25 feet. I was able to follow the voice of an audiobook narrator from one corner of the conference room when the laptop was placed in another at full volume. The speakers are ideal for mid to high frequencies. Frequencies below 250 Hz or above 9000 Hz are too much for the little speakers to reproduce. IO ports are a bit of a letdown on the IdeaPad 330 as it has all its ports on just one side. This particular model has on its left side, the power port, a LAN port, an HDMI port, two full-size USB ports (one USB 2.0 and one USB 3.0), a 3.5mm audio jack for headsets, and a regular-size card-reader slot. All the other sides of the laptop are bare. The right side (excluding the Kensington lock port) has only an optional DVD drive. This particular unit in review didn’t have that either. So in its place was a grey plastic cap. Not only did I have to make do with only two USB ports, but I also had to wire devices I used on the right side (like my mouse) specifically from the left side of the laptop. Most laptops have at least one USB port on either side. This weird placement could lead to a lack of space while connecting large dongles and devices with short or no extension cables. 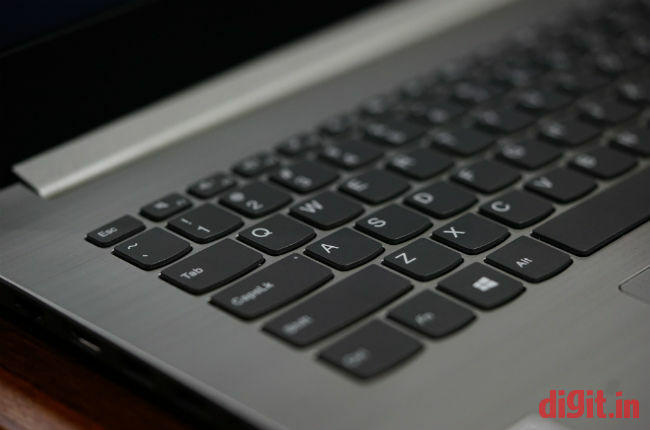 The keyboard on the IdeaPad 330 is similar to the one on the IdeaPad 330S, but shows more signs of flex when the keys are struck. The keyboard lacks dedicated keys for Home, End, Page Up, and Page Down functions. The keys on the keyboard look flat and feel shallow but are decent for everyday typing. That said, I still wouldn’t recommend it if your primary activity on this laptop involves a lot of typing. In the dark, you might find yourself straining your eyes to discern the keys as this keyboard has no backlighting. 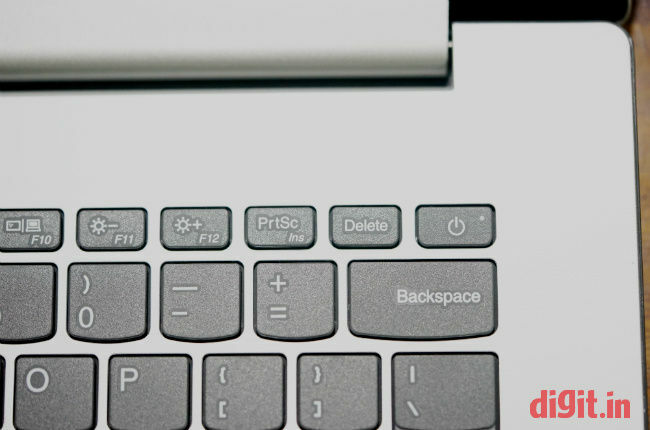 My personal experience with this particular IdeaPad 330’s keyboard was nothing short of exasperating. The power button in this model sits right next to the Delete key and looks exactly like it. This meant that I kept hitting the power button instead of Delete while typing. Luckily for me, accidentally pressing the power button like that did absolutely nothing to computer. This was strange because I had set the power button’s action as Hibernate in Windows’ Power Options. This wasn’t the worst for me though; what really tested my patience was the key for the letter A, because it worked only 50 percent of the time. Popping the keycap out and cleaning it didn’t help either. However, this could be an isolated incident to the review unit I received, but I would strongly recommend checking out the keyboard in full before pulling the trigger on this machine. To add to my dismay, the touchpad on the IdeaPad 330 was not a precision unit and the Lenovo website only offered a driver for the ELAN touchpad. With no additional utility to tweak the touchpad settings for taps and swipes, I could not use the double-tap. The triple-tap was set to activate Cortana by default and I did not see a way to change it. Apart from these setbacks, the touchpad worked well. The click buttons in the bottom half of the touchpad were easy enough to press and activate. Performance on the Lenovo IdeaPad 330 can only be termed sluggish. With its seventh-generation AMD E2-9000 APU, 4GB RAM, 1TB hard drive, and integrated AMD R2 graphics, the laptop booted to desktop in a disappointing 2 minutes, 5 seconds. Chrome took over 28 seconds to launch for the first time after a boot and about 6 seconds subsequently. There was a time lag of 2.5 seconds between pressing the Start button on the keyboard and the Start menu appearing almost every single time. Browsing on the IdeaPad 330 was a frustrating experience. Almost every single tab in a Chrome window of six tabs reloaded on reopening even if I had only just moved away from one. When over six tabs were open and one played music, there was a considerable lag in the audio playback. I was able to manage five open applications across two virtual desktops before seeing bigger signs of lag. Window animations, luckily, didn’t seem so jittery. But I didn’t dare to push the 80MB video memory on this AMD setup by playing any games on the laptop. Full HD video playback on YouTube was better handled than I expected; I saw no unexpected lags or jitters during playback. 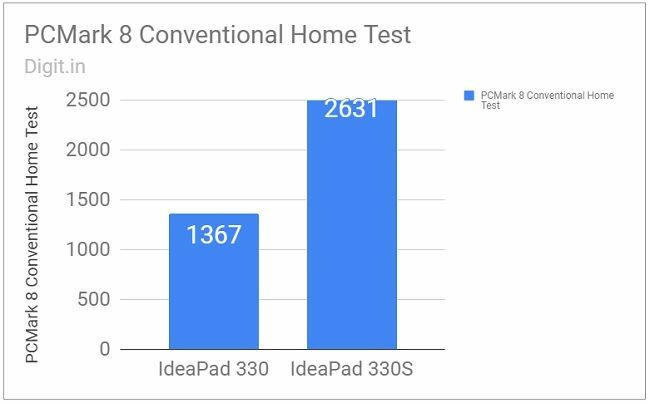 On benchmark tests like PCMark 8’s Accelerated Creative and Conventional Home and Work, the IdeaPad scored only half of what the Intel Core i3-powered IdeaPad 330S managed. Its scores on other benchmark tests in PCMark 10, Cinebench, and 3DMark too were abysmally low. To sum up performance on the IdeaPad 330, let me tell you what its speed compares to. I use a six-year-old Lenovo B480 as my work machine. With its third-gen Intel Core i3 CPU, 4GB of RAM, integrated graphics, and 500GB of hard drive space, it manages to run just as fast as the IdeaPad 330, if not faster in some areas. On PCMark 8’s Creative Battery Life test, the Lenovo IdeaPad 330 lasted 153 minutes on a single full charge, which is 7 minutes longer than what the IdeaPad 330S had managed. While performing daily tasks like writing and browsing with six Chrome tabs open, the battery lasted 3.3 hours. During the test, the Wi-Fi was turned on, Bluetooth off, and the screen brightness was set to 60 percent. In this time, I also installed a couple of applications. A battery life of around three hours on a laptop of this price bracket is still low, but not the worst. I feel battery life can be stretched close to four hours if fewer applications are run, and the screen brightness is turned down further. There’s no escaping it: the Lenovo IdeaPad 330 with an AMD E2-9000 APU and 4GB of RAM is a disappointing machine. The finish is convincing but the build is questionable. There are only two USB ports available and even they are placed on only one side of the laptop. The awkward keyboard and the non-configurable touchpad are passable, but the performance is, without a question, disappointing. All things considered, the Lenovo IdeaPad 330 does seem like that potential budget hatchback with enough to offer when seen in the showroom with all the features. But when you buy the base variant and see the lowest-end AMD APU struggling, an ordinary HD display, and a big blank grey cap instead of a functional DVD drive, you’re left staring at it with a straight face.